As a gluten-free blogger, I've learned to never miss the opportunity to taste food when it's concentrated in one area. As I explored around Union Market in DC, I knew that I had limited time but didn't want to leave without trying DC Dosa and Arepa Zone, the two most gluten-free friendly vendors I found. After eating the larger-than-expected dosa from the first stand, I decided to still order from the latter, but take my arepas to go. After all, I had to get back across town to Foggy Bottom to check out of my hotel then head back to Union Station to catch the train back to Baltimore. Arepas are a Venezuelan street food that consist of corn cakes stuffed with assorted veggies, meats, and cheeses. 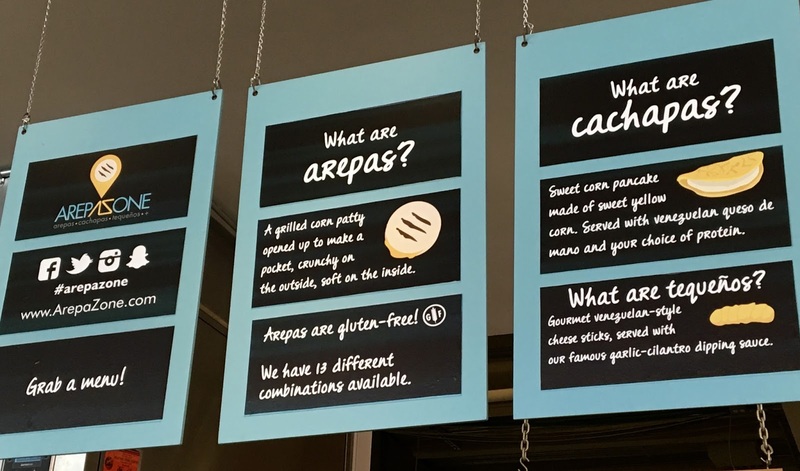 All of the arepas served up at Arepa Zone are gluten-free, and can be made dairy-free by holding the cheese. Vegetarian options are also available, so this spot is definitely one not to pass up on when visiting Union Market. What's really cool about this stand is that it is a brick and mortar location for a tried and true food truck that has earned accolades from critics and Washingtonians alike. 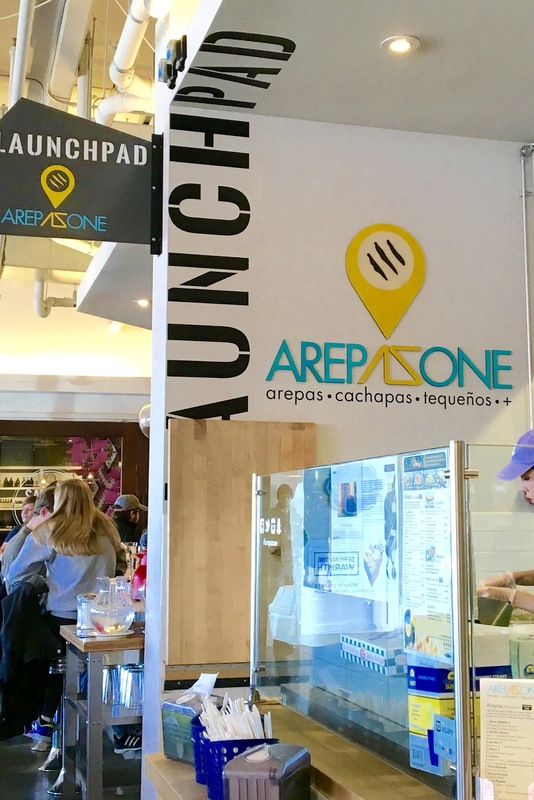 As business has boomed, this brick and mortar stand allows for fans to access arepas throughout the week to get their Venezuelan food fix. 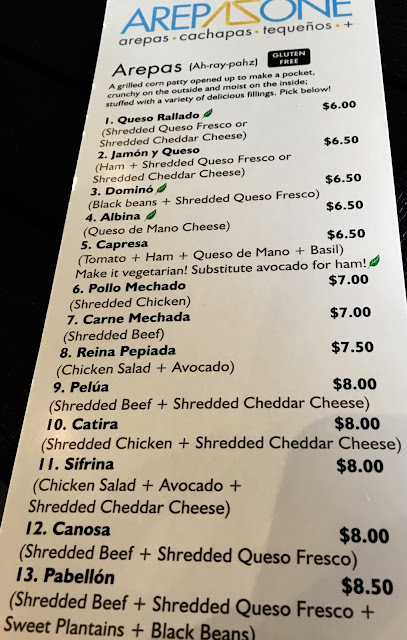 While all arepas are gluten-free, not all menu items at Arepa Zone are not. The cachapas are not, so do request that the grill be cleaned before your order is prepared. Because I was at Union Market when the market opened, the staff were busy making all of the arepa cakes for the day so I knew that the griddle had been cleared from the night before. There are over a dozen arepa varieties to choose from, and those with a leaf designation can be made vegetarian or vegan. Although I had previously ordered a dosa from DC Dosa, I couldn't pass up ordering one each of two arepas I was eyeing on the menu: the pollo mechado and vegan capresa. The pollo mechado arepa is stuffed simply with shredded chicken. I loved the tenderness of the chicken, and note of spice, which is not too heated but provides nice flavor. The arepa corn cake is stuffed generously with the meat, and provides a nice chewiness to contact with the meat. What I really liked about both of the arepas I ordered was that they were packaged to go in a way that made them really easy to eat on the go with one hand. I scarfed one down at the NoMa metro station and the other when I got back to the hotel a few minutes later. The caprese arepa is made vegetarian by swapping avocado for ham and made vegan by omitting the cheese. While the first arepa reminded me of arepas I have had in the past, this one was a new-to-me combination. I loved the creaminess of the avocado, thickness of the tomato, and strong herbal flavor of the basil. The arepa must have been grilled longer than the one used for the chicken one, because it did have a tad more crunchiness than the other, which was really satisfying. Arepa Zone certainly is a good spot to check out if you're in Union Market and seeking gluten-free eats. 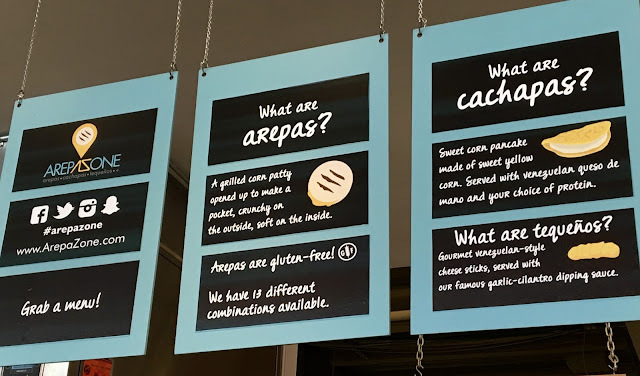 While I cannot say that the arepas I had knocked my socks off, they were pretty good nonetheless and definitely provided a rare opportunity to get to enjoy this rarely-found ethnic food. I liked the friendliness of the employees, but not that the opening time on the website and the actually opening time at the Market were an hour apart. While it was definitely worth the wait, having to wait around for an hour for the stand to open might not have been a possibility if I had to catch an earlier train. Be on the lookout for their food truck in and around the District (see schedule here). 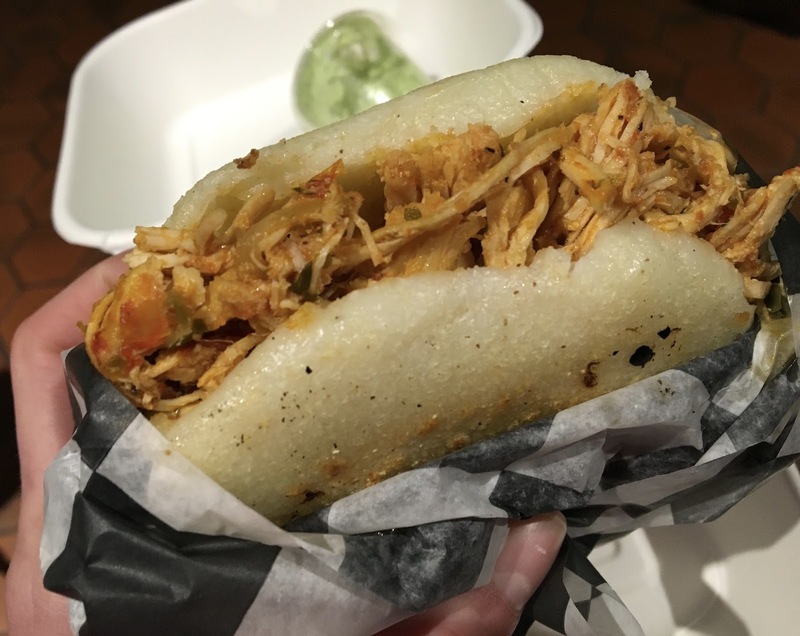 It's a fun way to get your arepa fix without trekking all the way to Union Market. Disclaimer: This review is based upon the information I have at the time of the review and does not reflect changes in ingredients or availability of items. Please contact the restaurant directly for up-to-date information and feel free to contact me with any questions or comments. I was not compensated for this review and it is a reflection of my personal opinion. Hi! I found your blog via the Find Me Gluten Free app. I'm so excited to read your reviews. Looks like you have a decent amount in DC. I moved here (DC) a year ago from Dayton, Ohio and I saw that you posted that you are from that area? How funny! I am originally from Columbus but lived in Dayton for many years. Anyhow, I'll have to try many of your suggestions, especially this Arepa place (since I miss Arepas & Co. in Dayton).